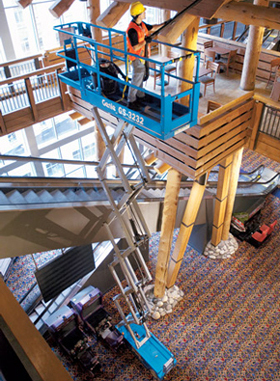 Ideal for maneuvering in tight spaces, Genie® slab scissor lifts are excellent for indoor and outdoor construction, maintenance and installation applications with ﬁrm, level surfaces. The numbers in the model make it fairly similar to the GS-2632 because its total width is also of 32″, but the main difference is in the vertical reach. 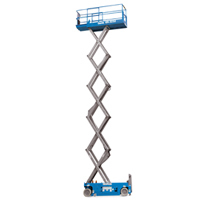 The Genie GS-3232 can go all the way up to a stunning 32 feet high (actually, its total reach is 38 feet if we count the lift as a whole).